Minister of State for Defence, Dr Subhash Bhamre inaugurated 75th raising day function of the Armed Forces Headquarters (AFHQ) Civilian Services here today. Speaking on the occasion, Dr Bhamre said that AFHQ civilian personnel have been standing firmly with the Armed Forces, providing them with the essential support and working for the safety of the nation with dedication and commitment, both in times of peace and war. He appreciated the administrative acumen and work culture of the cadre who have been working shoulder to shoulder with Service personnel and providing them with the logistical support in manpower, quartering, material management, administration and human resources development. The service cadre came to existence when the office of Chief Administrative Officer (CAO) was constituted in the Ministry of Defence on August 1, 1942 and all the civilians were brought under one Cadre Controlling Authority. 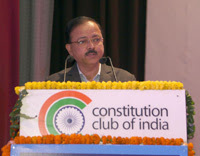 Defence Secretary Shri Sanjay Mitra also addressed the function, which was organised at Mavalankar Hall in the Constitution Club of India. 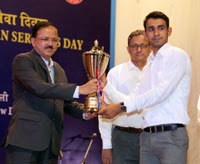 The dignitaries also gave away sports and cultural awards to outstanding personnel. Joint Secretary & CAO Shri V Anandarajan presented the Annual Report on the occasion. General Bipin Rawat, Chief of the Army Staff will be visiting Kazakhstan & Turkmenistan from 01-06 Aug 2017 with high level military delegation. During the visit, the General alongwith delegation will be visiting important military installations and is scheduled to meet a number of high ranking dignitaries of both the nations. During the visit to Kazakhstan from 01-03 Aug, General Bipin Rawat will meet Defence Minister, Chairman of the National Security Committee, Vice Minister of Defence and Aerospace Industry alongwith Commander-in-Chief of Land Forces of Kazakhstan. The delegation will also visit elite Air Assault Brigade and National Defence University at Astana where he shall be inaugurating the Indian Military Art Room. The visit to Turkmenistan from 04-05 Aug assumes importance as General Bipin Rawat is the first Chief of the Army Staff of Indian Army to visit the country. During the visit, General Bipin Rawat will be meeting Minister of Defence & Secretary, National Security Council, First Deputy Minister & Chief of Gen Staff alongwith Commanders of Land, Naval, Air & Air Defence Forces of Turkmenistan. The delegation will also visit the prestigious Military Institute & Military Academy of Turkmenistan. The visit to Kazakhstan & Turkmenistan is yet another outreach initiative to engage with our extended neighbourhood and strengthen the existing defence cooperation with the two nations.